The Nuclear AMRC is continuing work on key parts for the Bloodhound supersonic car, with production moving to the centre’s newest five-axis machining centre. The centre will be producing a second major structure for the car, which will carry the Nuclear AMRC’s logo as it attempts to set a new land speed record of over 1000mph. The Nuclear AMRC is producing seven parts of the rear sub-frame – the assembly that will hold the car’s rocket engine in place – out of aerospace-grade aluminium provided by Alcoa. These are large parts which will be holding some 27,000 pounds of thrust, so the centre’s machining team are applying all their expertise in manufacturing large systems which operate under the toughest conditions. Four parts are being produced on the HEC1600 horizontal machining centre, with two already finished and sent on to member company Hexagon Metrology for inspection. Another three parts are being made on the Nuclear AMRC’s new Hermle C60 U MT, overseen by NC programmer Mathew Challinor and advanced machine tool operator Andrew Smedley. The work is a good test of the capabilities of this extremely versatile five-axis mill-turn centre, and a test of the team’s skills in producing complex one-off components. “The learning curve for a machine with the capabilities of the Hermle is very steep, but the Bloodhound project has allowed us to make rapid progress,” says Challinor. 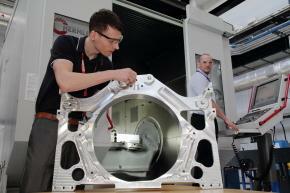 The Nuclear AMRC team will also use the Hermle to manufacture four parts for another vital structure for the car – the front suspension housing. This will also have to withstand extreme physical stresses while maintaining precise control of the car. 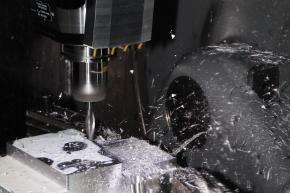 All parts have to made right first time, to tight deadlines. 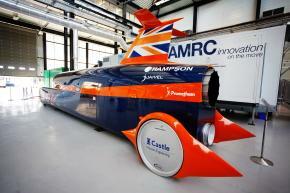 Bloodhound is scheduled to make its record-breaking attempt in South Africa in 2014.